OCEANFRONT END UNIT, Piscina, Wi-Fi grátis, vistas panorâmicas do oceano! Melhor localização no complexo. Um aluguer de férias para Ver Amantes! 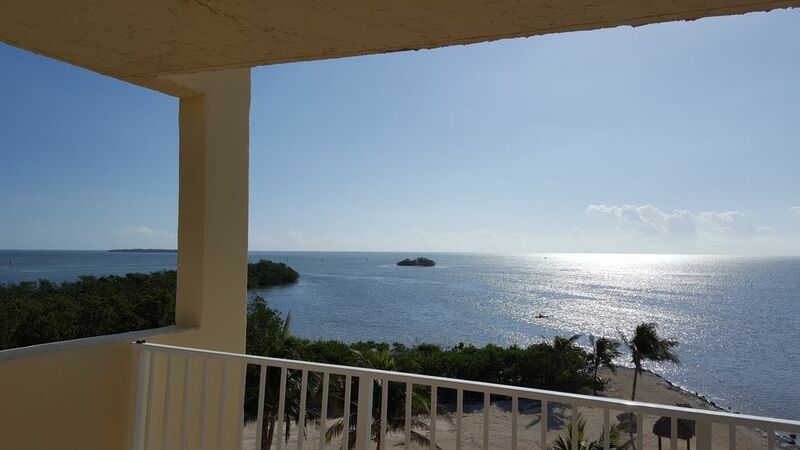 Bem-vindo ao Islamorada Keys Oceanfront Condo, 5 º andar unidade END, com uma sensação luminosa e arejada, vista panorâmica do mar e uma área de praia! Este alojamento, com todos os novos interiores post Irma, incluindo todos os novos pisos de cerâmica, cozinha e banheiros, é confortável e eclético, e em um edifício inspirado art déco maduro em um local sereno que está perto de restaurantes maravilhosos e outras coisas para fazer. Você está a poucos minutos do Old Tavernier Restaurant, o PADI certificado Florida Keys Dive Center, a uma curta distância de carro do centro de Islamorada, shopping, Worldwide Sportsman, Islamorada Fish Company, Founders Park com Pickleball e quadras de tênis, Teatro do Mar, o singular Wild Bird Center e muito mais. Alugar pranchas de paddle ou caiaques no PADDLE (apenas a 3 minutos) na Casa Mar próxima ou trazer o seu próprio. Você pode comprar frutos do mar locais frescos no Casa Mar Fish Market e desfrutar da melhor vista para refeições em sua varanda privativa à beira-mar. Ou aconchegue-se com um bom livro na piscina limpa à beira-mar. Também é divertido andar de bicicleta e explorar bairros adjacentes (alugar bicicletas ou trazer o seu próprio). Ou por que fazer alguma coisa, quando você pode simplesmente relaxar na sua varanda à beira-mar privada com vistas espectaculares 24/7! A varanda está aberta em 3 lados - então aproveite a brisa. O complexo não é na US 1, então não há ruído da estrada! Todos os sliders têm telas para desfrutar da brisa do oceano maravilhoso. O complexo inclui lavanderias operadas por moedas em todos os andares. Condomínio Keys Oceanfront congratula-se com você! Desculpe, não são permitidos animais por estatuto de associação. The condo was well furnished, located perfect for eveything we wanted to do. The view from the balcony was great, so nice to have breakfast looking over the beach and water every morning. There is still construction going on but it did not bother us at all. When they are finished with the repairs it will really be outstanding. Absolutely loved the updates in the condo. It is well equipped and clean. Very comfortable beds. Spent a lot of time at the pool. Very relaxing. The best part is the view. Really enjoyed watching the sunrise every morning on the deck while drinking a cup of coffee. The condo is in a great location, close to many good restaurants! Still our favorite place to stay in the Keys. It was great to see you back and welcome you back yet again any time. Beautiful view, updated condo, could use some new living room furniture, not very comfy. Kitchen has everything you'll need. Bedrooms have good mattresses. Bathrooms were nice. Pool was great. Went fishing three times on the party boats, caught lots of fish. All that's available for grills is one charcoal Weber down by the beach, would be nice if the condo association had a couple of propane grills with a propane tank attached to them. People tend to play music down by the pool, so if you are looking to relax bring your ear buds along. The mgr. did not seem to control the loud music situation in the pool area. But overall it's a great condo. We have a variety of seating options because we realize everybody likes different things. Sorry another guest was playing music poolside. Never had an issue with this in 13 years. My wife and I really enjoyed our stay. From the check-in process to arrival, everything was seamless. Not to mention, it was simply beautiful during our stay. The condo was fully equipped and had everything we needed for a relaxing week. It was nice to have high-speed internet and cable for night time movie watching. Updated furnishings, comfortable beds, nice showers/bathrooms. It was really nice. There was also plenty to do in the area. Shops/restaurants nearby and everything is within reach if you have a car. I really have nothing bad to say about our stay. If I would pick anything that could be improved, it would be the laundry facilities. We typically look for places with in-room washer/dryers but this place was so lovely we mad an exception. The place does have laundry facilities on each floor which was nice but we found the dryers didn't do a very good job drying the towels no matter how full or how little of a load we tried. Not really the owners fault so I don't blame them but hopefully the facility will look at updating these in the near future. There was also construction happening on the 1st floor which wasn't too bad but did hinder poolside relaxation on some days. Again not really the owners fault but did think it should be mentioned. I would not hesitate to stay here again if given the opportunity. You can't go wrong here if you're looking for a beautiful place to stay with awesome views but still have access to many sites and activities. Thanks again! Thanks for writing, Jake, I am glad you enjoyed your stay. Excellent, immaculate unit...great views, quiet. Only positive surprises...great bird watching. This unit is perfect. Wish I could’ve stayed longer! Thank you for writing, we welcome you back anytime. Nice condo, all new inside, as represented. Very nice condo as represented and property owner was very accommodating. Nice pool and beach area. Cartas de mergulho / mergulho, cartas de pesca, barco de festa Robbies, passeios de barco de fundo de vidro, Parque estadual de Reef Coral de Pennekamp, ​​Parque dos Fundadores, Teatro do Mar, Museu da História do Mergulho, adega local em Islamorada! Rates Include Free In-Unit Dedicated Wireless Internet Saturday to Saturday stays only Check In Time: 3 p.m.; Check Out Time: 11 a.m. $50 Discount per week for entire rental paid by e-check. No pets of any kind per Condominium Association rules. Additional 3% for international transactions. Security Deposit is $500 per week, to a maximum of $1,500 for a multi-week stay.